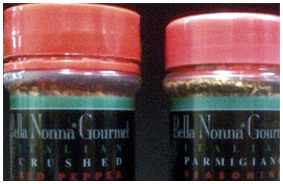 At Nova Label Company, we specialize in manufacturing custom labels for a wide range of industries. Here are just a few examples of the quality products and value added features that we deliver every day. 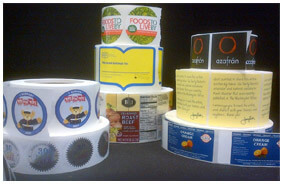 Roll Labels are available in virtually any size, material and adhesive, printing up to 10 colors. Rolls are easy to manage and can be used for affixing either by hand or machine. We run 4 flexographic presses that custom print, varnish, laminate, cut, perf, or sheet labels to your specifications. on 3 presses, maximum web width is 10”, and the 4th is 20” web. Our 5th press is inkjet digital hybrid. It has a maximum print width of 8.5” and can incorporate flexo printing where digital color can not match. It too provides the finishing you need….lamination, diecutting, perfing, and sheeting all in line. We provide a variety of direct mail label solutions, including pin feed address labels, piggyback labels, static cling, and bumper stickers and can foil stamp in-line, up to 20” wide. Our direct mail product is provided in roll form, fan-folded, or sheeted up to 18” wide and are specifically designed for your personalization and variable data needs. 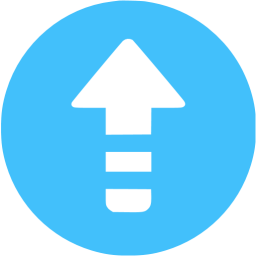 Provided on coated and uncoated paper stocks, they will image in your inkjet or laser printer solutions. 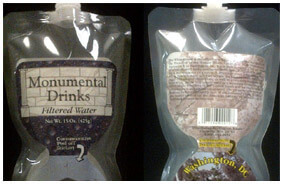 Custom food packaging labels take on all forms. Special attention is needed to be sure the right material and adhesive performs at it’s best. We offer a wide variety of materials and adhesives to fit that need. Samples will be provided for those hard to handle applications. And for the high production products, labels are provided to work on your auto applied applicators or semi automatic applicators. Available in up to 10 colors on paper, clear poly and white poly materials with UV varnish or lamination. Custom window decals are printed on clear static cling or clear poly with window graphic adhesive. These decals are face static and reverse printed and UV white is added for opacity. Printing can be added to the liner side for additional messaging. 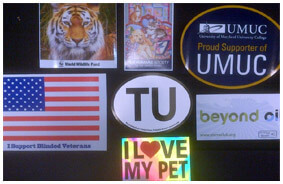 Bumper stickers are made from a durable white poly, typically with permanent adhesive. All are top-coated with clear UV varnish for protection. These too can be printed on the liner side for additional messaging when needed. 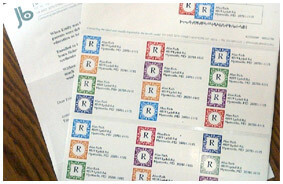 Sticker sheets are common for direct mail freemiums. These can be done on paper or poly materials and can be done with virtually any diecut configuration. Labels are an integral part of specialty packaging such as bottles, jars, boxes. Take advantage of the real estate it provides to decorate with your brand in vibrant color. We have the shapes and sizes to give your packaging a good impression…and speaking of impression, we can provide embossing on your label so your product rises above the others.